Smith Mortuary has been serving families since 1929. The mortuary was first owned and operated by Herman Adams and Bill Bumpers. The mortuary also had the ambulance service for many years. They owned and operated the mortuary for many years before selling to Cox Funeral Home in Paris, AR. 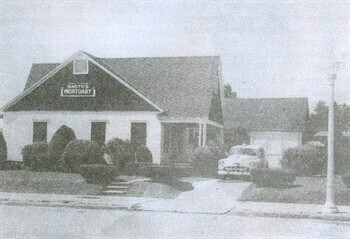 Cox owned the funeral home for several years until it was purchased by Dugan and Maymie Rainwater in 1949. Maymie's dad Arthur Smith, also owned a funeral home in Charleston. When the Rainwater's purchased the funeral home they combined the two and made Smith Mortuary. Willam Rice joined the staff of Smith Mortuary in 1953. In 1959 the Rainwater's sold the funeral home to Bill and Claude L. Edwards who owned it until William and Mattie Mae Rice purchased it in 1975. In 1994 the Rice family built the present building that is home of Smith Mortuary. Cy Hahn (William's daughter) and her husband Eddie Hahn took over the operations of the funeral home from 1991 til 1999. Smith Mortuary is proud to still be an Arkansas based and owned funeral home. William Rice was a mortician and funeral director for over 40 years. His whole career was served at Smith Mortuary in Charleston, Arkansas. He started in 1953 when Dugan and Maymie Rainwater owned the business. William remembered Mr. Rainwater saying that he hired him because he was the only one that came in wearing a suit when he ask for the job. William was known for his attention to detail and caring personal service. That is the heritage that every staff member of Smith Mortuary is expected to maintain. Even though we continue to enjoy the advantages of the technological age, we have not forgotten the funeral service is still and always has been people serving people. The present employees of Smith Mortuary strive to give your family and friends the level of service that you have come to expect. As our present employees share the same core values that the Rice family shared in helping your family tell the "story of life's journey". The success of our business is built on the friendship of those we serve.